The process to construct the Minotaur 4 rocket began with the hoisting of the launcher’s first stage at pad 46 at Cape Canaveral Air Force Station. The lower three solid-fueled stages of the Minotaur 4 come from the Air Force’s stockpile of decommissioned Peacekeeper missiles deployed in the 1980s to hurl nuclear weapons to targets around the world. A spokesperson for Orbital ATK, which operates the Minotaur family in agreement with the U.S. Air Force, confirmed stacking of the Minotaur 4 booster recently started at Cape Canaveral. 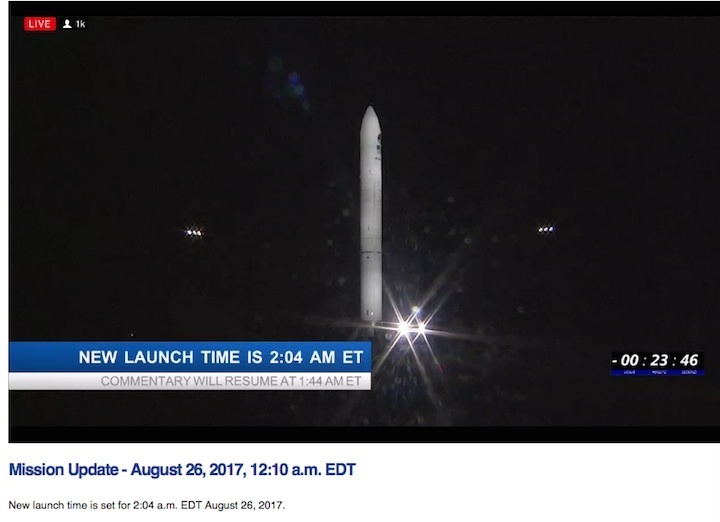 Liftoff is set for Aug. 25 at 11:15 p.m. EDT (0315 GMT on Aug. 26), the opening of a four-hour launch window. The Minotaur 4 is typically made of four stages — the three Peacekeeper motors and an additional commercial Orion 38 solid rocket on top — to send military satellites into orbit. Minotaur 4 variants have launched payloads into orbit on three occasions from Kodiak Island, Alaska, and Vandenberg Air Force Base, California, and a shortened three-stage version has launched two times on suborbital missions. The build-up of the next Minotaur 4 rocket at launch pad 46 should be complete by mid-August, along with the attachment of SensorSat, a microsatellite designed to locate and monitor movements of spacecraft and debris in geosynchronous orbit, a belt more than 22,000 miles (nearly 36,000 kilometers) over the equator. SensorSat will go into a unique equatorial orbit at an altitude of around 372 miles (600 kilometers). The mission’s unusual equator-hugging orbit required engineers to add an additional Orion 38 upper stage, making the Minotaur 4 set to launch later this month a five-stage booster. The final Orion 38 motor burn will reduce the angle of the ORS-5 satellite’s orbit, redirecting the spacecraft to fly over the equator. Some details of SensorSat’s mission remain secret, but the satellite will be a gap-filler to provide geosynchronous tracking data to the military after the retirement of the Space Based Space Surveillance, or SBSS, satellite launched in 2010, which is nearing the end of its design life. A follow-on space surveillance satellite is scheduled for launch in the early 2020s. SensorSat is funded by the Air Force’s Operationally Responsive Space office, a division established in 2007 to seek less expensive ways to field satellites and launch opportunities for the military. The Air Force also calls the space surveillance mission ORS-5, and the spacecraft was developed by the Massachusetts Institute of Technology’s Lincoln Laboratory. 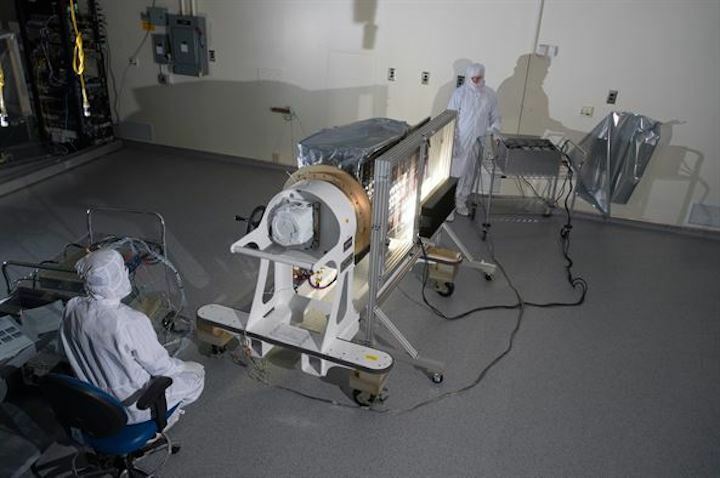 With a mass between 175 and 250 pounds (approximately 80 to 110 kilograms), SensorSat will collect “unresolved visible imagery of resident space objects in geosynchronous orbit from a novel low Earth orbit,” according to information posted on Lincoln Laboratory’s website. Pad 46 last hosted a space launch in 1999, when a Lockheed Martin Athena rocket took off with an experimental Taiwanese satellite. Located on the easternmost tip of Cape Canaveral, the launch pad was dormant until Space Florida, a state government agency set up to lure commercial aerospace business to the Sunshine State, took over the facility and brokered the deal to bring Orbital ATK’s Minotaur rocket to the Space Coast. Technicians partially assembled an inert Minotaur 4 rocket at pad 46 earlier this year to rehearse stacking procedures. The U.S. Air Force Space and Missile Systems Center’s Operationally Responsive Space Office completed a major program milestone after overseeing the successful delivery of their ORS-5 satellite from Lexington, Massachusetts to Cape Canaveral Air Force Station, Florida for final processing, encapsulation, stacking and integration for launch. 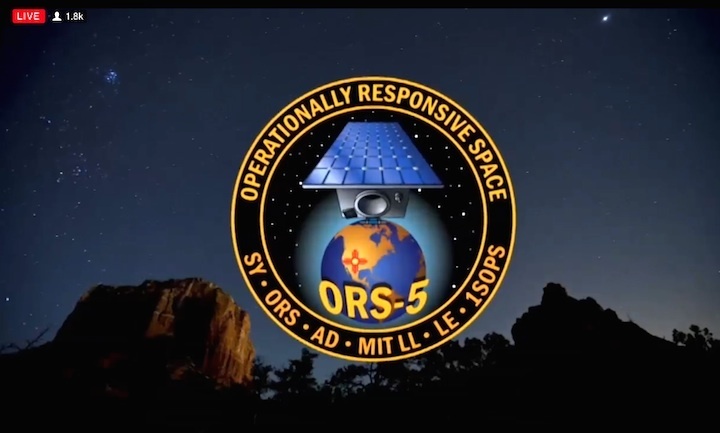 The ORS-5 satellite is scheduled for launch Aug. 25 at 11:15 p.m. EDT from Launch Complex 46 at Cape Canaveral Air Force Station. 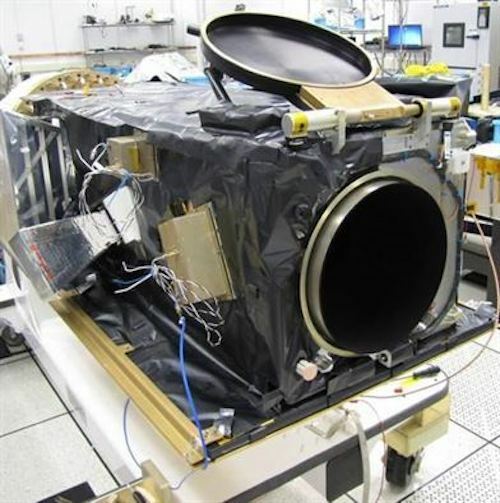 Upon its delivery, the ORS-5 satellite, also known as SensorSat, was processed for encapsulation in the Astrotech Space Operations Florida processing facility. A combined government and contractor team of mission partners executed final ground activities including a Launch Base Compatibility Test to verify satellite integrity after shipment, an intersegment test to verify communication compatibility from the satellite to the on-orbit operations center and the final battery reconditioning for launch, prior to its integration with the Minotaur IV launch vehicle. 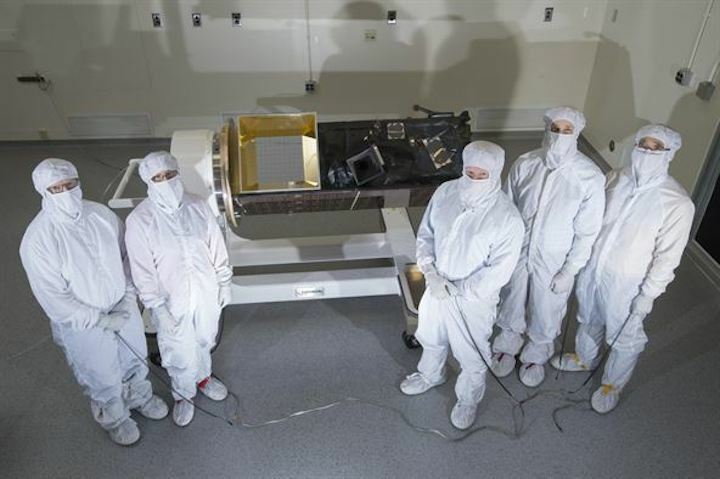 The satellite was transported from the MIT Lincoln Laboratory facility in Lexington, Massachusetts, in a customized shipping container. 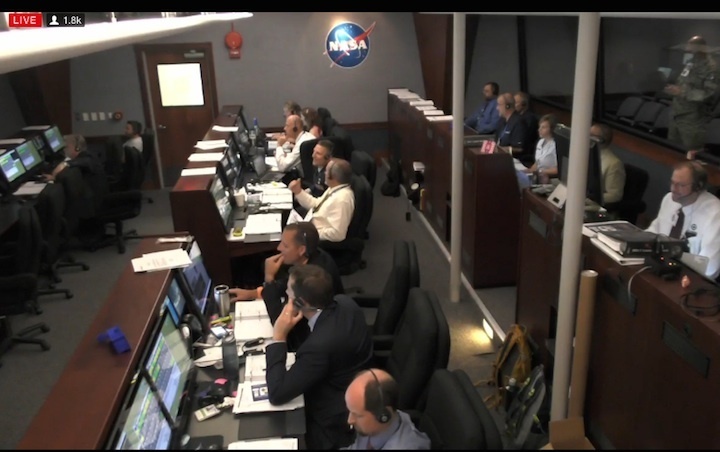 The transport crew ensured the satellite was transported safely and according to the time sensitive schedule. 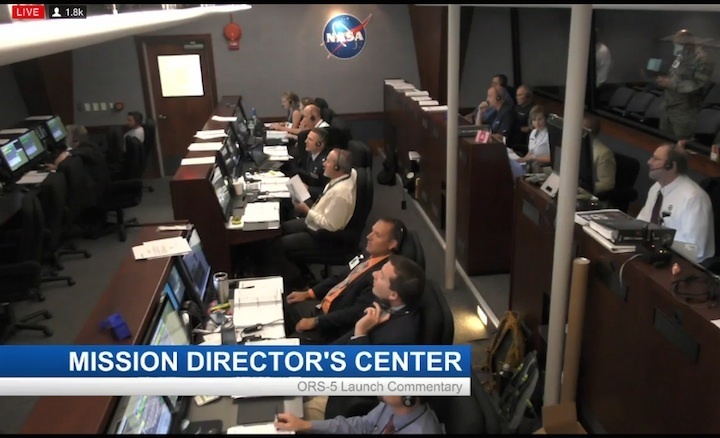 “The safe transport, processing and integration of ORS-5 to the Minotaur IV launch vehicle was paramount and the total government and contractor team worked tirelessly to ensure mission success,” Thompson reiterated. Air Force Space Command's Space and Missile Systems Center, located at Los Angeles Air Force Base, Calif., is the U.S. Air Force's center of acquisition excellence for acquiring and developing military space systems. Its portfolio includes the Global Positioning System, military satellite communications, defense meteorological satellites, space launch and range systems, satellite control networks, space based infrared systems and space situational awareness capabilities. The Minotaur 4 rocket, made up of five solid-fueled stages, is scheduled to fire into space from pad 46 at Cape Canaveral next Friday night, Aug. 25, at 11:15 p.m. EDT (0315 GMT on Aug. 26). The mission has a four-hour window to lift off, or else wait until another day. The spacecraft closed up inside the Minotaur 4’s nose cone is named SensorSat. Developed by the Massachusetts Institute of Technology’s Lincoln Laboratory, the Air Force-funded mission will spend three years scanning orbital traffic lanes, detecting and tracking satellites and space debris in a belt nearly 22,300 miles (35,800 kilometers) over the equator. Objects at that altitude remain over fixed geographic positions on Earth, making geostationary orbit an ideal location for military and commercial communications satellites, weather observatories, and intelligence-gathering spy craft. SensorSat is managed by the Air Force’s Operationally Responsive Space division, an office established in 2007 to investigate lower-cost satellites and launchers. The Air Force calls the mission ORS-5, the latest in a line of projects aimed at testing out new satellite and launch innovations. 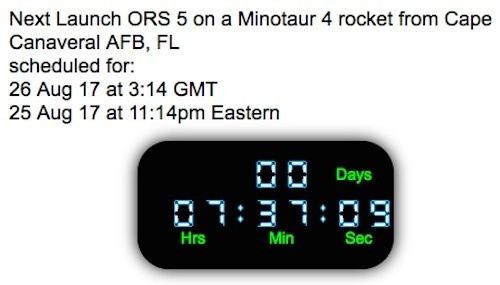 Next week’s nighttime blastoff will mark the first Minotaur launch from Cape Canaveral. Five Minotaur 4 rockets have launched on suborbital and orbital missions since 2010 from sites in California and Alaska. The three main rocket motors that will power the Minotaur 4 into space came from stockpiles left over from the Air Force’s retired nuclear-tipped Peacekeeper missiles. The rocket motors were filled with pre-packed solid fuel in the 1980s, then placed on alert in missile silos until the military decommissioned the Peacekeeper. Two commercially-produced Orion 38 rocket motors built by Orbital ATK, the company charged with operating the Minotaur, will do the extra lifting to place SensorSat into orbit. The Minotaur 4 usually flies with a single Orion 38 motor as a fourth stage, but SensorSat’s unusual orbit requires another boost. The fifth stage motor will give the relatively small 249-pound (113-kilogram) SensorSat satellite a kick into an equator-hugging orbit at an altitude of approximately 372 miles (600 kilometers) at zero degrees inclination. 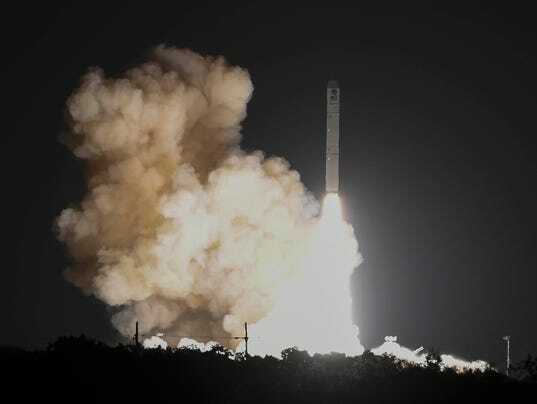 The Air Force paid $27.2 million for the launch, opting for a commercial-like launch service to keep costs to a minimum. 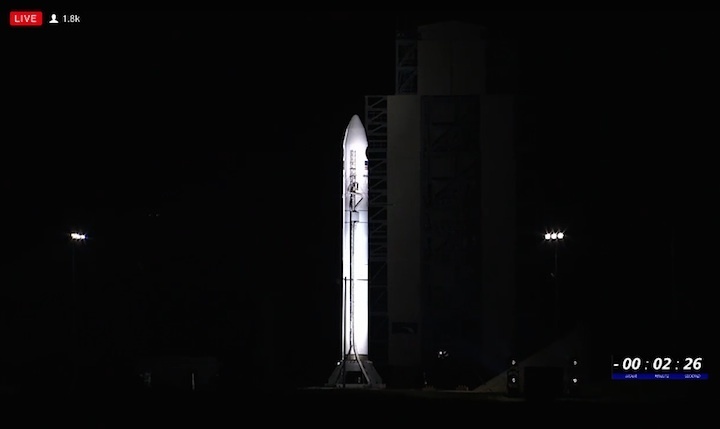 Orbital ATK considered basing the launch from a Minotaur pad at Wallops Island, Virginia, but the site is too far north to reach the equatorial orbit needed on the ORS-5 mission. Another option Orbital ATK briefly considered was setting up a temporary Minotaur launch pad at the European-run spaceport in French Guiana, just north of the equator, but Cape Canaveral eventually became the best choice once engineers devised a way to add another rocket motor on top of the Minotaur 4. Ground crews at pad 46 topped off the Minotaur rocket Tuesday with the addition of the SensorSat satellite and the Orion 38 fifth stage motor already closed up inside the launcher’s nose shroud. The first four stages of the Minotaur 4 will fire in quick succession in the first 15 minutes of the flight to climb into a preliminary parking orbit between around 248 miles and 372 miles (400 to 600 kilometers) above Earth. That temporary orbit will have a tilt of approximately 24.5 degrees to the equator. 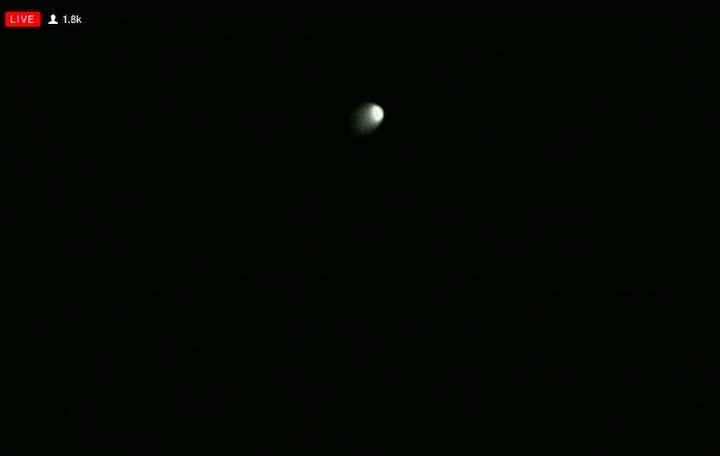 During the 10-minute coast until ignition of the fifth stage motor, the Minotaur will release two CubeSats for an undisclosed U.S. government agency, and a three-unit shoebox-sized CubeSat for the Defense Advanced Research Projects Agency, or DARPA. 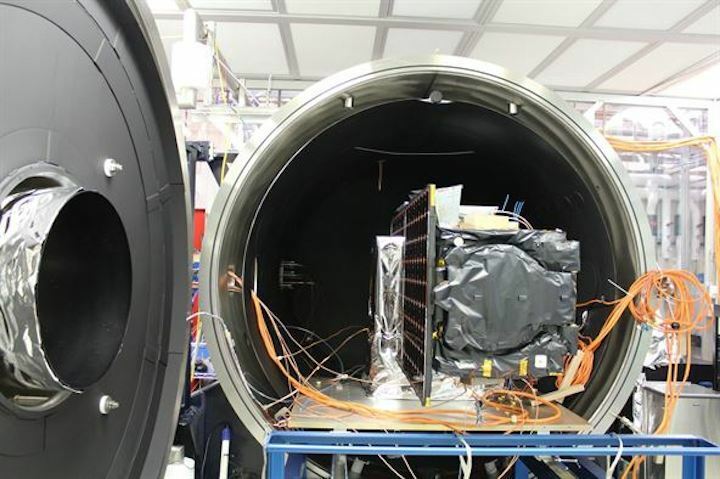 Seattle-based Spaceflight made arrangements for the CubeSats launching on the Minotaur 4. The Minotaur’s last firing will last a little over a minute. 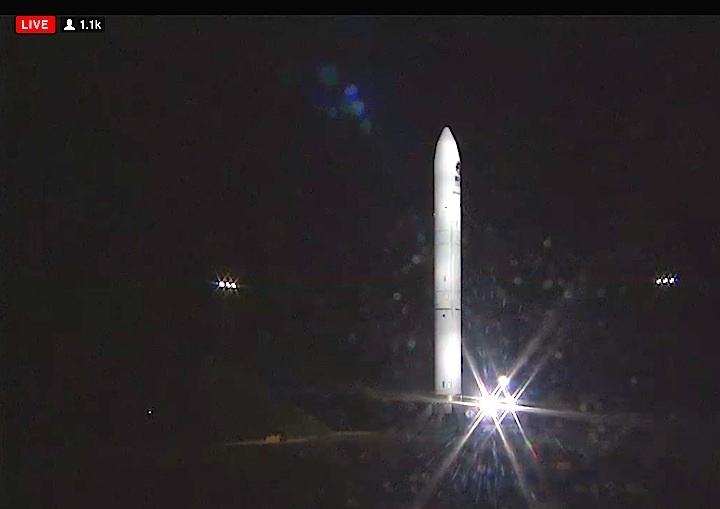 With stacking of the Minotaur 4 now complete, attention turns to testing the rocket. A full mission dress rehearsal with the pad team and launch controllers is scheduled for Monday. The rest of the week leading up to launch day will be spent installing ordnance and preparing to arm the vehicle. Luchi said the Minotaur team had to work around a busy launch manifest at Cape Canaveral. A SpaceX Falcon 9 rocket took off last Monday, Aug. 14, and a United Launch Alliance Atlas 5 booster launched Friday. “This is the first time that we’ll take Minotaur out of the Cape. We have some experience in the past on other vehicles, but bringing Minotaur to the Cape obviously presents some challenges,” Luchi said in an interview with Spaceflight Now. Orbital ATK is preparing the Minotaur 4 for launch at pad 46, a rarely-used facility operated by Space Florida, the state government agency chartered to lure commercial aerospace business to the area. The last launch from pad 46 occurred in 1999. The Minotaur launch team raised three inert Peacekeeper stages at pad 46 earlier this year in a pathfinder test to familiarize themselves with the ground facilities and verify their compatibility. The Air Force-run Eastern Range is also getting acquainted with the Minotaur for the first time. 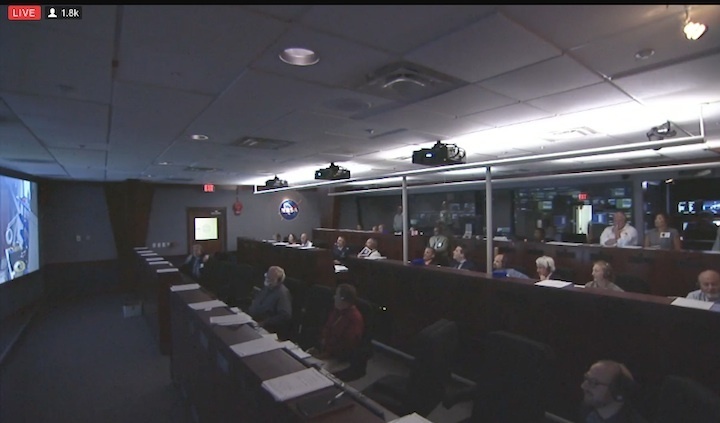 While there are no more Minotaur missions from Cape Canaveral on Orbital ATK’s manifest, Luchi said the experience gained on the ORS-5 campaign could set the stage for future Florida-based flights. “I think we’re done with this one time (at Cape Canaveral), it’s going to be all that much easier in the future,” Luchi said. Orbital ATK has one more Minotaur 1 launch in its backlog from Wallops Island, Virginia, in late 2018. 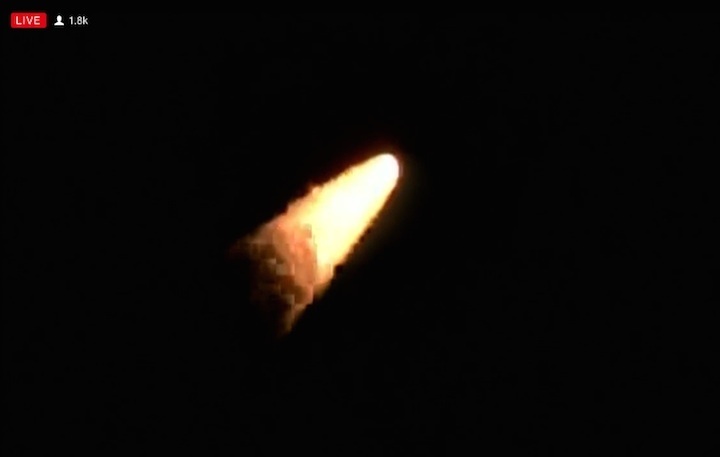 That flight, using a smaller version of the Minotaur based on retired Minuteman missile stages, will loft a classified spacecraft for the National Reconnaissance Office. Joyce said Orbital ATK anticipates future Minotaur launch contracts from the U.S. government for small-class satellites. Because they use government-furnished rocket motors, the Minotaur 1 and 4 families are restricted from competing for commercial launch awards, a U.S. government policy that has drawn the ire of Orbital ATK, which sees privately-owned satellites in the Minotaur’s lift envelope, including many U.S. payloads, going up on Indian, Russian and European launchers. Proponents of the policy say that selling already-built missile motors into the commercial launch market would dampen innovation and keep new companies from introducing commercial rockets. Several companies are working on commercial small satellite launch vehicles. Some have major strides, including a full-up test flight in the case of the U.S.-New Zealand company Rocket Lab, but none have successfully placed a payload into orbit.  File image of the Minotaur rocket at an earlier launch campaign at Wallops. 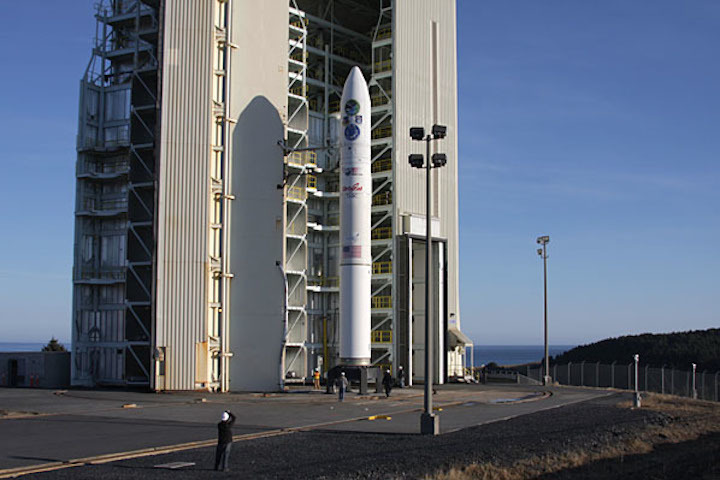 The 1st Air and Space Test Squadron at Vandenberg Air Force Base will be assisting with the first ever Minotaur IV launch from Cape Canaveral Air Force Station. 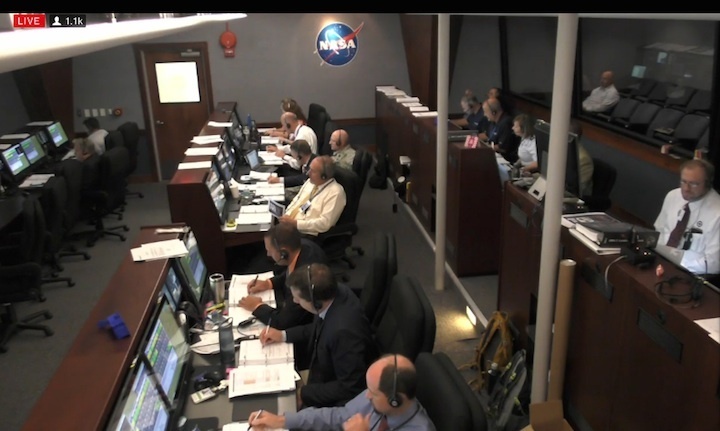 The 1st ASTS team coordinated the transport for the first three stages of the engine to Cape Canaveral AFS where they will provide support through the day of launch. The Minotaur IV is an expendable launch system derived from an old Peacekeeper Intercontinental Ballistic Missile. "We have specialized equipment here, where we stack the Minotaur and make sure they are good to go," said Capt. Julian Martinez, 1st ASTS mission integrator. "The upcoming launch at Canaveral is a Minotaur IV vehicle, which is an old peacekeeper system. There are five stages, and the DoD owns the first three. We are the only Air Force blue suit team that is able to maintain, ship and handle all of these rocket components. When we are out there we always get referred to as 'the Air Force guys', because we are the only uniformed personnel that have a direct impact on ground operations." As the only unit in the Air Force that can stack and transport the Minotaur IV, the 1 ASTS utilizes experienced missile maintainers on a space assignment. 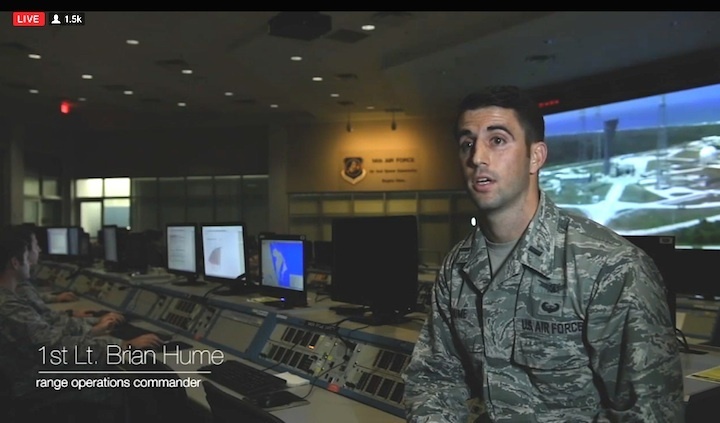 "As a unit we rely heavily on the missile maintainers that have prior experience in the missile fields," said Brian Tafoya, 1st ASTS flight chief. "Even though we are now on the space launch side of the house, we are able to use the knowledge of the ICBM delivery systems to ensure we do our part in the launch process. It is a bit different than what we are used to. Instead of loading a missile into a silo we get to stack it on a launch pad. 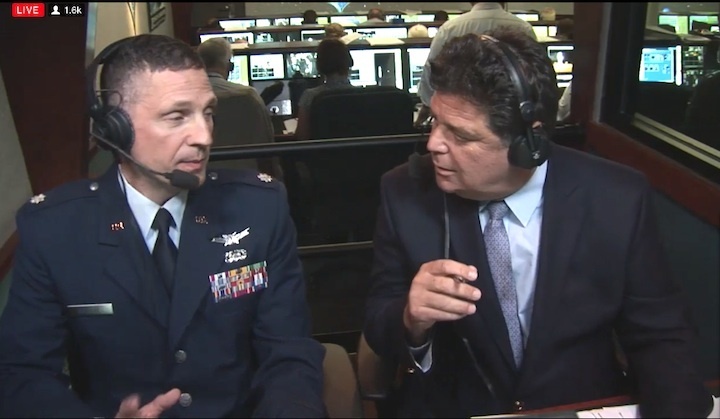 Our ICBM experience translates directly into the small space lift mission and is a pretty unique experience." The primary responsibility of the 1st ASTS is to ensure the launch vehicle is processed and stacked for a successful mission. "For this upcoming launch from the Cape, we shipped the first three stages out about a month before the projected launch date," said Martinez. "After the boosters arrive in Florida, we coordinate with the 45th Space Wing to use their cranes to load the boosters onto Minotaur specific trucks called Type-II's, for convoy to the launch pad. After all three stages are stacked on the launch pad, we hand custody off to the launch service provider, Orbital ATK. Stage four and five are owned by Orbital ATK and include the payload, avionics, and instrumentation." With a low launch tempo for the Minotaur family of vehicles, the 1st ASTS team is constantly training. This prevents future discrepancies and maintains currency. "We don't launch a lot of these, so one of the ways we stay ready for a real operation is by practicing," said Martinez. "We run through procedures and talk with quality assurance, keeping everything up to date. This mission will launch August 25th from Cape Canaveral AFS is a pretty monumental event for the whole squadron. 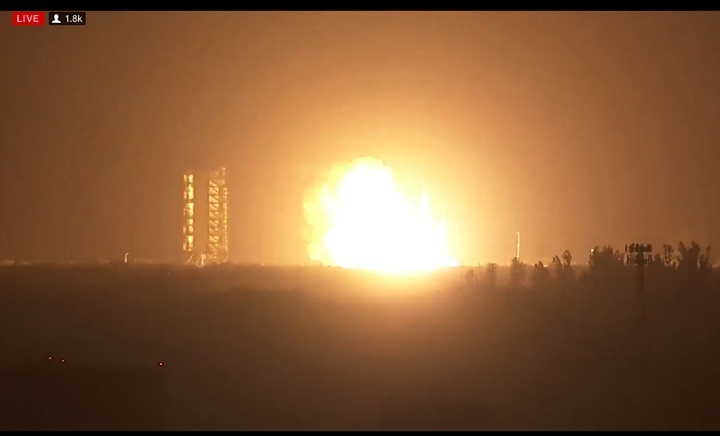 The team will be traveling to watch the launch, and perform post-launch equipment recovery." The team may be small, but what they lack in numbers they make up for in dedication and expertise. "When we conduct an operation like this, from cradle to grave, it gives us a sense of pride," said Tafoya. "We have maintained a mission ready posture and now have a chance to prove what we can do. It is always a challenge to stay consistent across a few year gap between missions, but we do, and when we have a Minotaur launch we are mission ready." 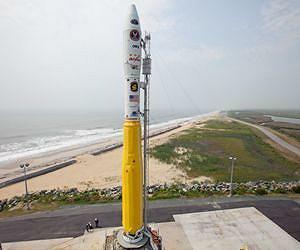 Dulles, Virginia 24 August 2017 – Orbital ATK (NYSE: OA), a global leader in aerospace and defense technologies, today announced it is in final preparations to launch the company’s Minotaur IV rocket from Cape Canaveral Air Force Station, Florida, on Friday, August 25, at approximately 11:15 p.m. EDT. 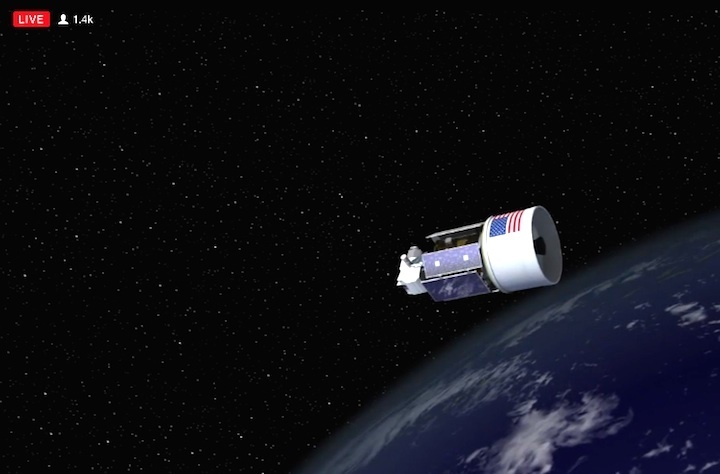 The Minotaur IV will carry the U.S. Air Force’s Operationally Responsive Space-5 (ORS-5) spacecraft, which will monitor satellites and space debris to aid the U.S. military’s space situational awareness. Building on the Minotaur family’s 100 percent success rate, this mission will mark the 26th flight for Orbital ATK’s Minotaur product line and the sixth flight of the Minotaur IV configuration. Minotaur vehicles are based on government-furnished Peacekeeper and Minuteman rocket motors that Orbital ATK has upgraded and integrated with modern avionics and other subsystems to produce an affordable launcher based on reliable, flight-proven hardware. The Minotaur IV is capable of launching payloads up to 4,000 lbs. (or 1,800 kg.) to low-Earth orbit. 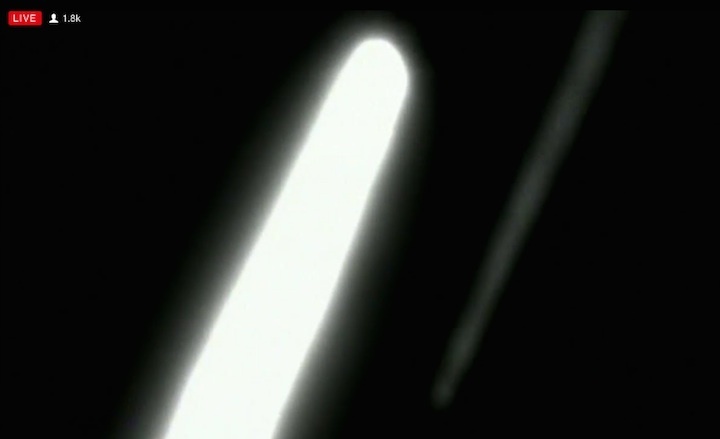 Minotaur rockets have previously launched from ranges in California, Virginia and Alaska. This will be the company’s first launch of a Minotaur rocket from Launch Complex-46, managed by Space Florida. The Minotaur product line is provided via the Orbital/Suborbital Program (OSP-3) contract and managed by the U.S. Air Force Space and Missile Systems Center (SMC), Launch Enterprise, Experimental Launch and Test Division (LE/LEX), and Rocket Systems Launch Program (RSLP) located at Kirtland Air Force Base, New Mexico. 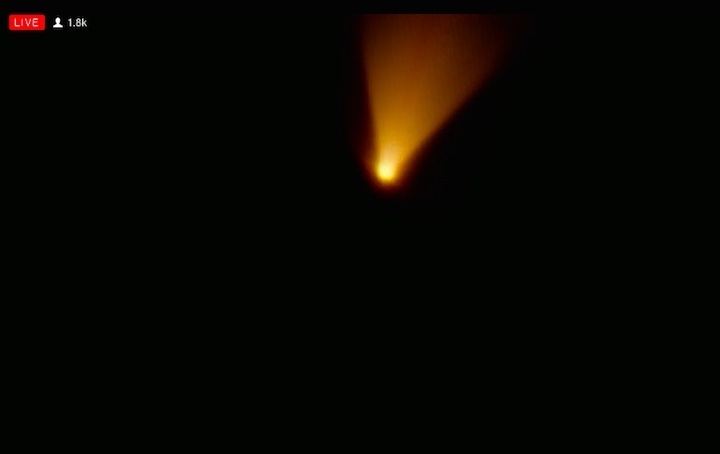 Live coverage of the Minotaur launch and details about the mission are available at www.orbitalatk.com. 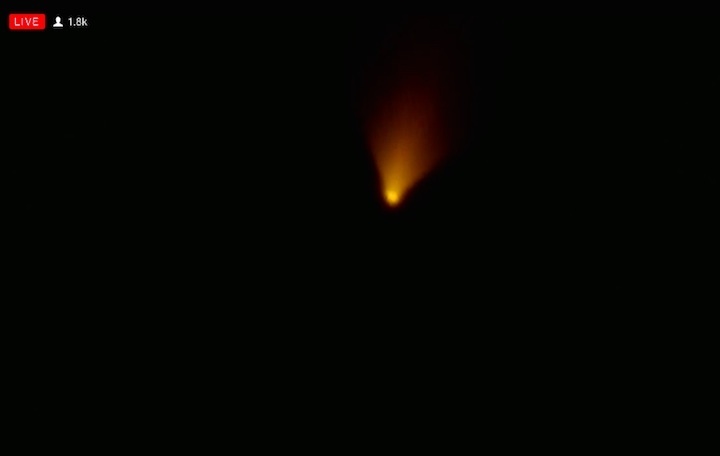 Orbital ATK’s Minotaur IV, making its first launch from Florida, shot from long-dormant Launch Complex 46 at 2:04 a.m. Posted Aug. 26, 2017 Orbital ATK video. 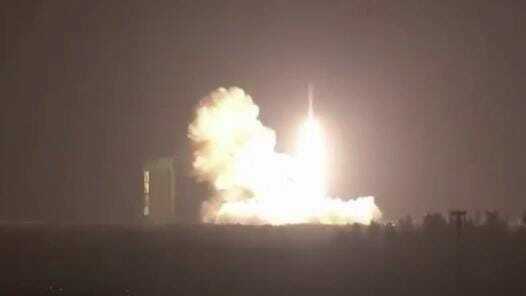 A rocket powered by remnants of a Cold War nuclear missile bolted from Cape Canaveral early Saturday with an Air Force satellite that will track threats to military spacecraft orbiting high overhead. 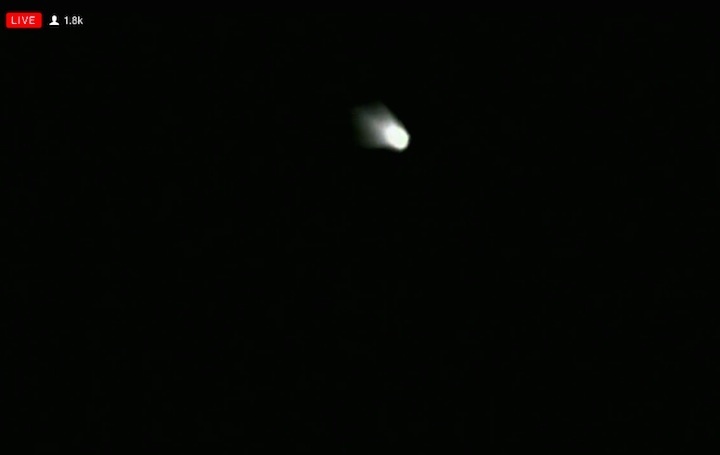 Orbital ATK’s Minotaur IV, making its first flight from Florida, shot from long-dormant Launch Complex 46 at 2:04 a.m., catapulted by 500,000 pounds of thrust generated by the first of three decommissioned Peacekeeper intercontinental ballistic missile motors. 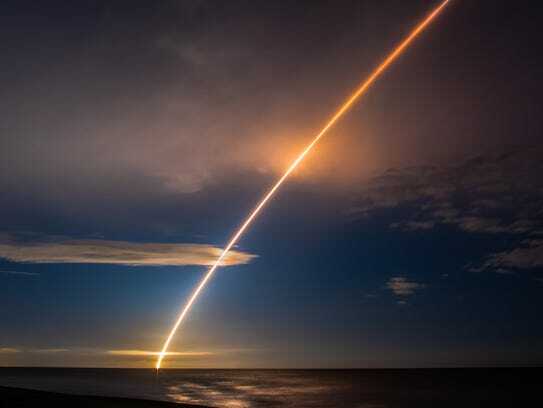 Within a half-hour, the five-stage, solid-fueled rocket dropped off SensorSat, a coffee table-sized satellite, about 370 miles over the equator. From that vantage point, the $87.5 million mission will survey a region 22,000 miles higher up known as geostationary orbit or the “GEO belt,” home to critical national security satellites providing intelligence, communications, missile warning and weather data. “It’s sort of analogous to a surveillance radar at an airport, which goes around and around and around and around, surveilling the domain,” said Grant Stokes of the Massachusetts Institute of Technology’s Lincoln Laboratory, which built the satellite. The 250-pound telescope will record the brightness and position of spacecraft seen as dots far above it. More capable spacecraft, including two pairs patrolling the higher orbit, will be able to take closer looks at any objects of interest. Those could include potentially crippling space junk, but also Russian or Chinese spacecraft making aggressive maneuvers. That’s because space assets are more ingrained in daily operations than ever before. “There’s basically not a military operation the U.S. has today that doesn’t rely on space to some extent,” said Weeden.